Just about everyone I know thinks the government’s plan to legislate mandatory internet filtering is a really bad idea. This could lead me to believe the majority of Australians are as passionate about internet censorship as me and my friends. But then I remember that most of my friends are university educated, left-leaning types who work in journalism or the IT industry. This same selection bias is at work in the online community, particularly on Twitter. The sort of people who use Twitter, who blog, who read the IT media are precisely the sort of people who would oppose internet censorship. This has led many people to believe if they make enough noise about it online, the Government will drop the filter. Unfortunately, this greatly overestimates the importance and influence of Twitter and social media generally when it comes to real-world politics. This was the top article on The Drum for at least a few minutes. Even an infinite number of angry posts on Twitter, sarcastic blog posts and articles in the IT press would still have no effect on Government policy. Politicians only care about who can deliver them blocs of votes in important electorates. 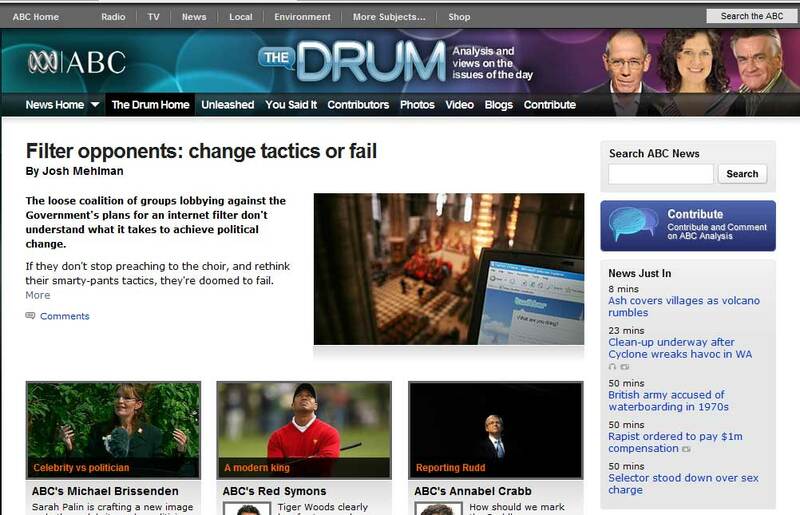 As I argue on ABC’s The Drum blog, so far the Christian lobby – which is for the filter – is doing this a lot better than the disparate anti-filter coalition. This is not to say the anti-censorship campaign is doomed. However, it needs to focus less on preaching to the choir and more on real-life, professional political lobbying. It’s a big ask, particularly because many of the anti-censorship groups have little experience in direct political action. But it must be done if we are to convince the Government of the immense folly and dire (supposedly) unintended consequences of its current plans.